Information compiled from the Historian’s Notebook by Leona Schmidt and the Press article by Merle Burleigh. Township government, the oldest form of government continuing to function today, began in North America in 1636. The early Americans who wanted to escape from the autocratic government of Europe started it. Established as a pure democratic process, the people have a direct voice in this grassroots government. This began at the Annual Town Meetings where people from surrounding areas came together to discuss important issues and establish laws. Today townships continue to hold Annual Town Meetings on the second Tuesday in April. r government is comprised of eight elected at-large to serve four-year terms. 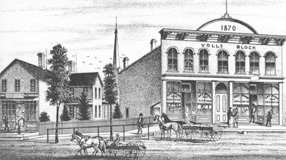 In Illinois, township government began in 1849. The Illinois Constitution of 1848 allowed voters in each county to choose to establish township governments or a county commission form of government, without township units. Today, 85 of the 102 counties in Illinois operate under the township form of government. There are currently 1,433 townships in the state serving more than 8 million people. Townships are individual geographical areas, separate from cities and counties. For example, a large city may contain several townships while one township may encompass several towns. Township government operates at local levels and is designed to serve the basic needs of the community. In many rural areas, townships are the only unit of government available to provide social services and road maintenance. When the General Assembly approved the township form of government in 1849, DuPage County voters overwhelmingly adopted it in November, 773 to 1. Three appointed commissioners… Joseph Naper, Daniel Fish and Erastus Hills… then divided DuPage into townships, or towns as they were referred to then. Early in 1850 the legal voters in the township held their first meeting to select a name for the township. Erastus Hills suggested the name Winfield, and doing so they ordered that the town(ship) be called Winfield. Reasons for the choice were not given but a reasonable assumption has been that our township was named for General Winfield Scott, who marched across the county during the Blackhawk War. Charles Gary hosted the first Town Meeting of Winfield Town(ship) in his home in 1850. William C. Todd was elected Supervisor; C.L. Shepherd, Town Clerk; Charles Gary, the Overseer of the Poor; James Brown, Job A. Smith and Israel Mather, Commissioners of Highways; Amos C. Graves and Thomas M. Griswold, Constables and Harvey Higby, Town Collector. The rural character of the township was evident in the principal business voted upon at the meeting. It was decided four-and-a-half feet was “the height of a good and lawful fence.” Buck sheep were to be penned August through November. The following year $100 was levied for roads. Winfield Township continued to flourish. In 1853 Harvey Germaine was named Justice of the Peace. The aggregate property value was $160,329. During this period in history there were 8 school districts, 3 churches, one academy, one gristmill, 2 sawmills, 12 stores, 10 factories, 3 post offices, 2 railroad stations and a population of 1,600. The thirty-six square mile area which was comprised of “three pleasant villages:” Warrenville, West Chicago and Winfield is known as Winfield Township. Winfield Township is one of 9 townships in DuPage County and one of 1,433 townships in Illinois. Our government is comprised of eight elected at-large to serve four-year terms.